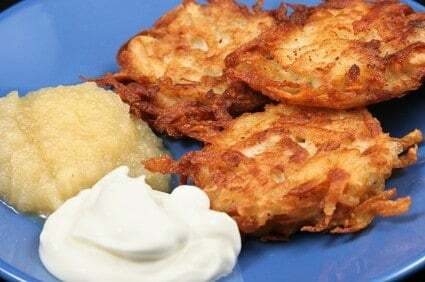 Latkes are often enjoyed during Chanuka, but why just have them once a year? This recipe was adpated from Frugal Gourmet Celebrates Christmas. Latkes are a great potato side dish everyone loves. Be sure to serve with plenty of sour cream and applesauce. Squeeze as much of water out of potatoes as possible. In a bowl, mix with the remaining ingredients. Place a bit of the mixture spread out to 4 inches in a frying pan containing a little peanut oil. Fry until golden brown on both sides. Serve the pancakes with a bit of sour cream and applesauce on top of each.